PULLMAN, Wash. – As a child growing up in Saudi Arabia, chemical engineering major Ali Alibrahim knew he wanted to be an engineer. Unfortunately, his hometown didn’t offer educational opportunities to help youth in his community pursue their passions. This summer, Alibrahim travelled back home to change that. Working with Al-Zahra, a Saudi organization which focuses on educating children, Alibrahim was able to offer the first robotics engineering class for students, ages 12-16 in Al-Ahsa, Saudi Arabia. 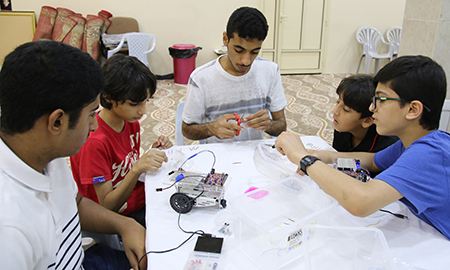 During this six-week program, Alibrahim taught 25 students basic engineering skills using on basic robots. His students learned how to assemble the robots and how their electrical circuitry works. In addition, they learned some basic programming to be able to control the robots. “We are looking to teach students new engineering skills that will help them in the future,” said Alibrahim. In preparation for their teaching program, Alibrahim and fellow student Muntathir Almuhanna spent three weeks in WSU’s Frank Innovation Zone, programming and assembling the robots, which they purchased with their own money. The class was developed to open up possibilities for students in their future education. For Alibrahim, engineering allowed him to study abroad in the United States. His education helped him broaden his horizons. He hopes this early exposure to engineering education will open up doors for his students as well. “Our goal is to our goal to empower students with an opportunity that can help them in future,” said Alibrahim.